Hype Cycle from Gartner Inc.
Gartner has an interesting Hype Cycle Research methodology that is based on a visualization. When new technologies make bold promises, how do you discern the hype from what’s commercially viable? And when will such claims pay off, if at all? 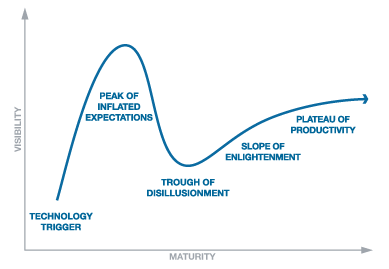 Gartner Hype Cycles provide a graphic representation of the maturity and adoption of technologies and applications, and how they are potentially relevant to solving real business problems and exploiting new opportunities.